The Benefits of Wood Fences Cannot Be Overstated! 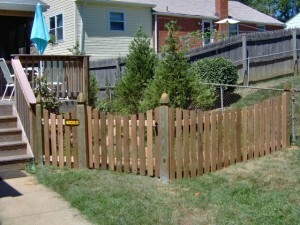 Wood fences are a popular option in Newport News, Virginia. It gives neighborhoods a homey feel and completes every housewife’s dream of having her white picket fence. Picket fencing is not the only wood fencing option to choose from. Wood fence options also include split rail, board, privacy, and post. There are many reasons why wood fencing is a viable option for your home, and among those include being cost efficient, easy to maintain, and environmentally friendly. Wood is significantly less expensive than glass or iron. Sure, those materials can look prestigious but wood fences can look humble and inviting. Wood boards are easy to manufacture and transport. Installation of wood fences is also cheaper than others. This type of fencing is durable and lasts for decades at a time. Wood fencing has been a top choice for homeowners for many years. This is because wood fences boost curb appeal thus enhancing property value. Families with dogs are more likely to choose a home that already has an enclosed area for their pup to play. They save money this way when purchasing a home with a pre-existing fence, but you reap the benefit of being able to initially increase the house’s price. Wood fencing is easy to fix if damaged. Boards can be replaced and paint can fix a dent in the wood. If you somehow sever a wrought-iron fence, the whole structure would need to be replaced. Over time, wood fences need to be treated. The cost of treatment is very low so it is easy to let someone else do the work and not have to worry about it. Obviously wood fences are not green in the literal sense of the word. They are “green” in regards to the trend of maintaining an environmentally friendly home. Wood will mature and settle into its surrounding environment. Over time, your wood fence will look so natural in accordance with your property. Make sure to keep up with treatments so that mildew does not build up on it. Since 1955, Hercules Fence has been providing residential and commercial wood fence installation throughout Northern Virginia. We pride ourselves on our extensive wood fencing options. But, perhaps best of all, as the largest fence company in Virginia, Hercules Fence is able to offer you a premium quality wood fence without the premium price tag. That’s what we like to call a win-win! All of our lumber meets and/or exceeds industry standards, as well as conforms to the latest EPA requirements. If you have any questions about Wood Fence Installation, you can contact Hercules Fence of Newport News, Virginia today by calling (757) 316-3600 or visit FencesNewportNews.com today! We are the largest fence company based in Northern Virginia. You can also follow Hercules Fence on Facebook, Twitter, Google+ and YouTube. This entry was posted on Wednesday, January 28th, 2015 at 5:48 pm. Both comments and pings are currently closed.